The calculator was able to follow the movements of the moon and the sun through the Zodiac, predict eclipses and even recreate the irregular orbit of the moon. 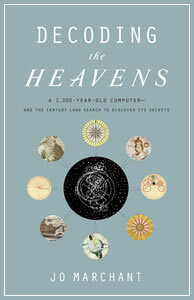 The team believe it may also have predicted the positions of the planets. A loyal reader — Howdy, Cate! 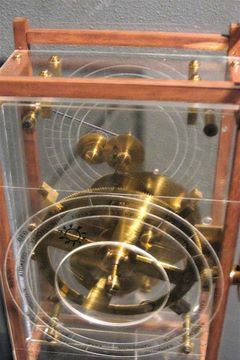 — decided to swing by the American Computer Museum in Bozeman, Montana, when she realized that a replica of the Antikythera Mechanism was there. Evidently it’s a “nightmare” to photograph — “stuck in a corner with poor lighting” — but this photo looks pretty good to me. Note that they put plastic in place of the original bronze plates to make the internal mechanisms visible to non-Kryptonians. Using modern computer x-ray tomography and high resolution surface scanning, a team led by Mike Edmunds and Tony Freeth at Cardiff University peered inside fragments of the crust-encased mechanism and read the faintest inscriptions that once covered the outer casing of the machine. Detailed imaging of the mechanism suggests it dates back to 150-100 BC and had 37 gear wheels enabling it to follow the movements of the moon and the sun through the zodiac, predict eclipses and even recreate the irregular orbit of the moon. The motion, known as the first lunar anomaly, was developed by the astronomer Hipparcus of Rhodes in the 2nd century BC, and he may have been consulted in the machine’s construction, the scientists speculate. 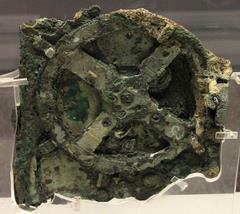 This “computer” is the famous Antikythera Mechanism, so named because it was recovered from a shipwreck off the coast of the Greek island of Antikythera.